Comfortably blending modern conveniences with local traditional charm. 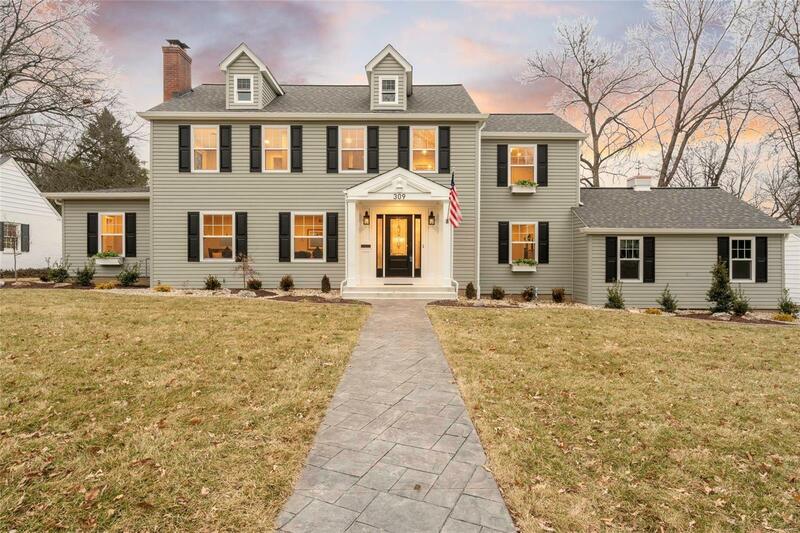 You will love this gorgeous 1.5 story home just blocks from downtown Webster Groves. Situated in a friendly community with great neighbors and schools, what more could you want? This home was substantially renovated and expanded in 2018 for the person wanting to move right in today. This home features a modern traditional exterior matched with an inspiring transitional interior. 3/4" thick 4" plank hardwood floors primarily throughout the 1st and 2nd floor. Kitchen: Custom cabinetry, Dual islands, Cambria quartz tops, open shelving on island. Master bedroom with tray celling and grass cloth accent wall. Freestanding Jacuzzi soaking tub w/Brizo polished nickel tub filler. 2 fireplaces. Circulater ceiling detail. Custom 6" base trim & 5" crown throughout. Open loft parlor w/exaggerated plaid design. Lower level has custom wainscoting and luxury vinyl floor with additional space to build out. Fence. Sprinkler. Courtesy of One West Associates, Inc.